The Celigo possesses powerful built-in image analysis software that allows the user to identify cell populations based on a variety of parameters such as morphology measurements or fluorescent intensities. 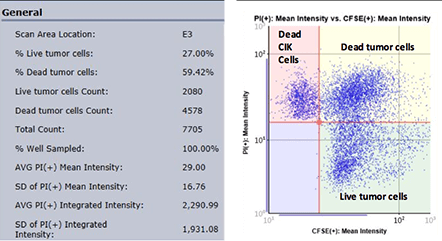 The flow-like gating interface with histogram and scatter-plots graphics are linked to the captured cell image. This allows users to visually monitor and confirm the placement of the gate by looking at the gated cell population in real-time. By plotting the mean fluorescent intensity of CFSE versus the mean fluorescent intensity of PI in the Celigo graphic interface, we can acquire populations for the number of live, dead and total cells, as well as the percent viability. Directly imaged and counted immune cells include cytolytic cells: CIK cells, NK cells, Neutrophils and CAR-T cells. Define the population of interest by plotting the cells based on cell area. Cells that fall within the gate on the histogram are counted (outlined in yellow), those cells that are too small (outlined in blue) are considered debris and are gated out. 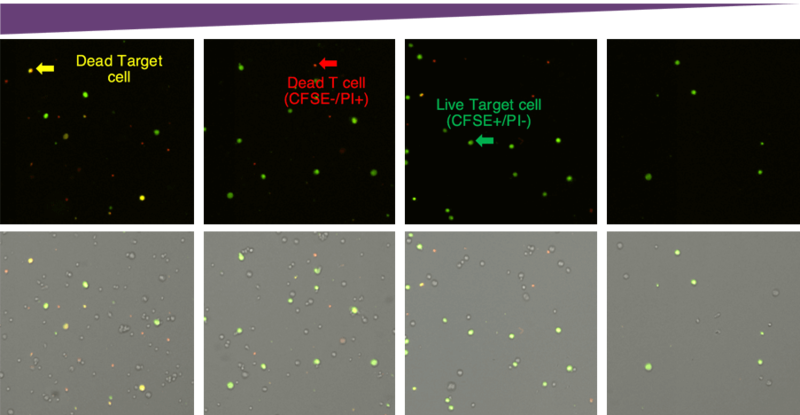 By examining the captured images, we can visually see that the number of dead target cells (Yellow), decreased as the antibody concentration decreased. This observation is supported by plotting the cells based on the mean fluorescent intensities. There is a greater number of plotted cells in the upper two quadrants, which represent dead cells. We can also see that the number of live cells (lower right quadrant) is increasing in number as we decrease the antibody concentration. Target and effector cell fluorescent and bright-field overlay images. Cells from the above images are plotted below based on the mean fluorescent intensities. Fluorescent intensity gating for cytotoxicity percentage. The number of dead target cells increased as the E:T ratio increased, which can be visually seen in the scatter plot. The gating interface provided the number of live and dead target cells which was used to calculate the final cytotoxicity percentage.